Welcome to our wire rope hoist page. Here you will find the information regarding the innovative, modular ZX wire rope hoist along with the various configurations it is available in. 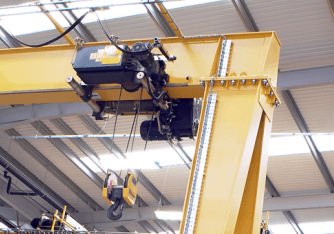 These include a foot / base mounted hoist, single girder hoist and a double girder crab hoist. 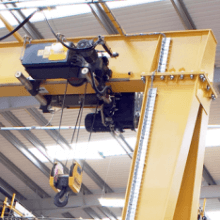 The ZX hoist was developed over 10 years ago using innovative, intelligent design to provide one hoisting system for use on any type of overhead crane. Every component and detail has been finely honed for optimum performance, easy load handling and exceptional safety levels. Gearbox: The gears are housed within a cast aluminium case. It is in here where they are immersed in a permanent oil bath to provide smooth operation year after year. The gears themselves have been case hardened and precisely ground. They incorporate tip relief & crowning to ensure smooth and reliable running. Because the gearbox is hollow shafted and drives the drum shaft directly there is no need for an overhung pinion & barrel spur arrangement which would be located outside the gearbox. What’s more there is an inspection plate which can be easily removed for accessing the gear train. Rope Guide: This heavy duty, robust rope guide is simple to install and reduces the wear on the wire rope and the drum. This rope guide guarantees that the rope will scroll positively and so prevents damage when the rope is slack. The rope guide incorporates an inner clamping band which is spring loaded. This prevents rope build up and therefore damage to the rope guide if the hook is lowered onto a surface causing a slackened rope. Made from oil impregnated nylon it is resistant to permanent distortions and is not prone to breaking. Hoist Brake: The brake system on the ZX hoist is easily & completely accessible. 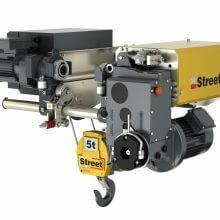 This is due to the fact that it is not positioned within the motor cover like most other wire rope hoists. This makes maintenance tasks so much easier. The brakes are the disc type and have asbestos free linings for health and safety reasons. They are low maintenance and incorporate a hand release device as standard. Bottom Block: The newly designed bottom block on the ZX hoist helps to improve both safety and handling due to its ergonomics. Each sheave has a rugged cast aluminium cover and no-maintenance bearings. The bottom block includes a standard fit spring loaded catch for additional safety. 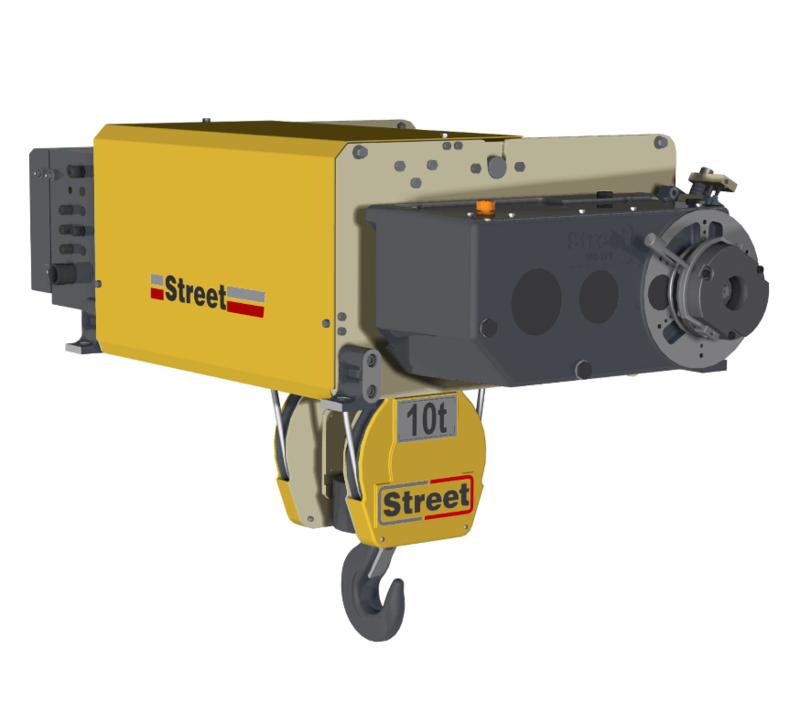 Limit Switches: There are 2 limit switches on the ZX hoist. One to prevent over-hoisting and one to prevent –over-lowering which can cause damage to the wire rope, drum, motor, bottom block and even the load. The switches are adjustable to suit different lifting operations. They are activated by the rope guide when it is travelling over the drum. Overload safety: The ZX wire rope hoist has an adjustable capacity restrictor in the form of a torque arm cut out device. This device does not just measure the load on the 1 or 2 ropes. It actually measures the total load the the hoist mechanism is transmitting. It is activated by the load, not by measuring the electric current. This device will not affect the height of lift. 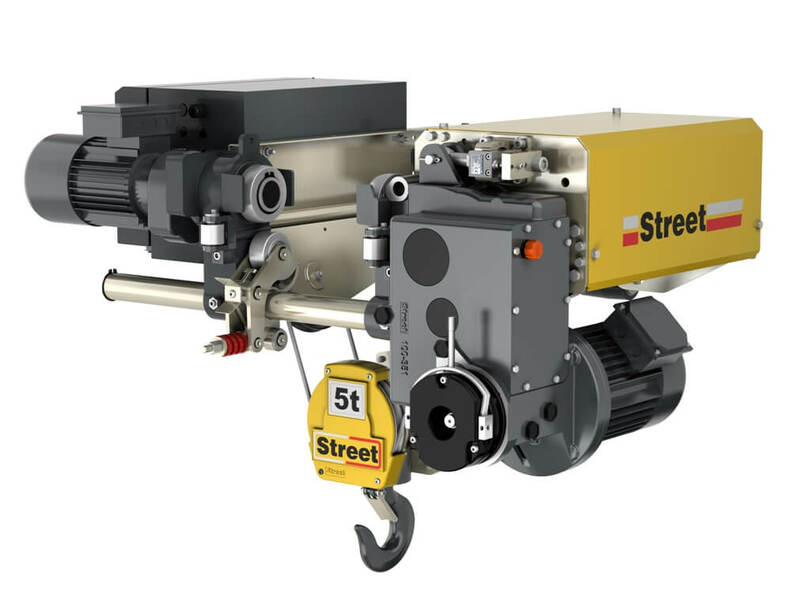 Cooling and Ventilation: Overheating can be a problem with many wire rope hoists, but not the ZX. 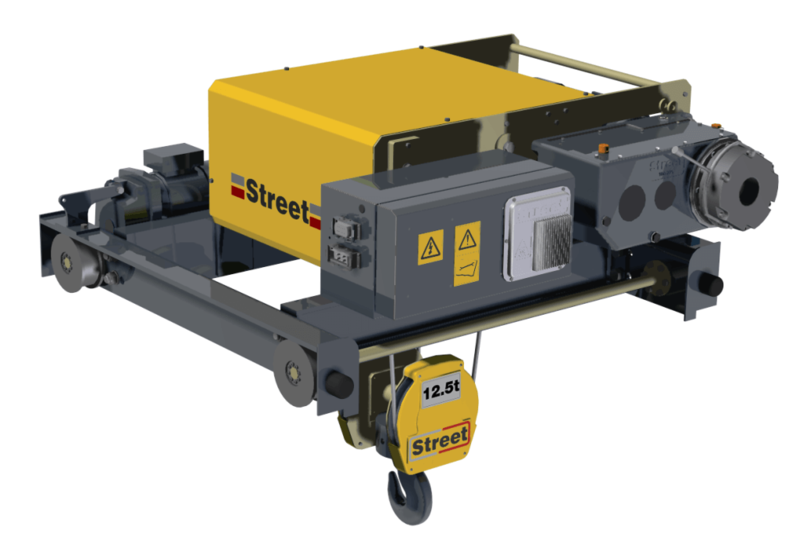 This system has many innovative features to aid in the cooling of the hoist. The hoist motor is positioned on the outside. This gives optimum cooling as well as built-in overheating protection in the hoist motor. Other features include; class ‘F’ insulation, cylindrical rotor fan, remote mounting of the motor & brakes to prevent heat transfer and IP55 protection from dust/particle & water ingress. Trolley motors also include cast aluminium finned cooling fans. 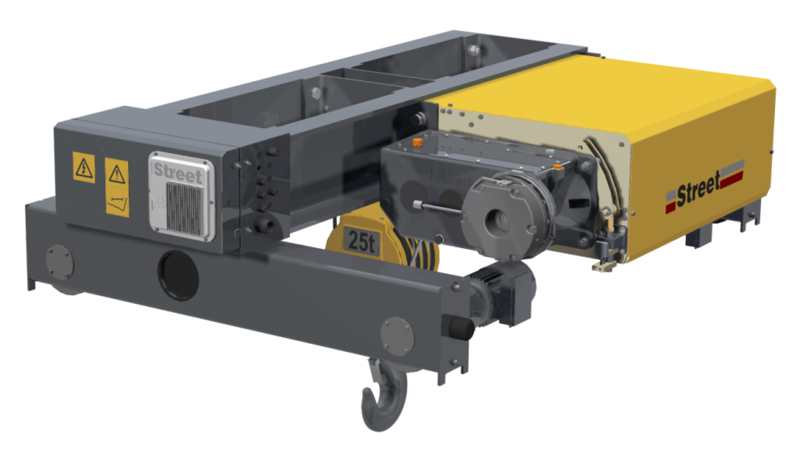 The trolley systems designed specifically for the ZX hoist are direct drive for long term reliability with no overhanging pinion to drive the trolley wheel. The oil bathed, precision ground gears directly drive the trolley. These incorporate flangeless steel cross-travel wheels and high guide rollers for excellent durability and wear reducing properties. Also the traverse drive can be easily removed without needing to touch the wheels or gearing. The trolley wheels can also be removed. 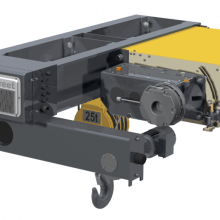 There is a sprung roller resting under the beam which removes the need for a counterweight and also increases the lifespan of the wheel rolling area. Control Panel: The ZX hoist uses an IP55 rated steel electric control panel. Incorporating a quick release socket & plug connections and easily accessible components. There is a meter which records the hours in service. If the electricity supply fails in any way the phase failure relay kicks in and prevents the hoist from operating. This also works if the power voltage is too high or too low. Over heating kept in check with aluminium fins to transfer heat out. Safety: The ZX wire rope hoist incorporates many features for enhancing the safety of the hoist to superior levels. 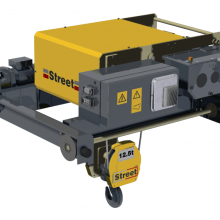 The exclusive arrangement of the hoist brake, motor and gearbox greatly enhances load safety. Automatic braking if the power fails is also another top safety feature of the ZX hoist. Unlike most other hoists the brake is applied to the gearbox shaft and not the motor shaft. 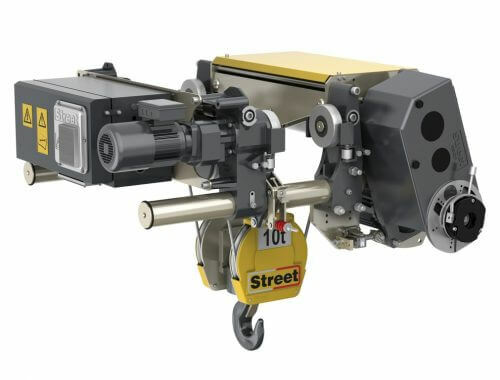 This ensures the load will be held safely even if the motor is moved , disconnected or damaged. All configurations use the same components of the basic ZX hoist model and so will include all the key features listed above. 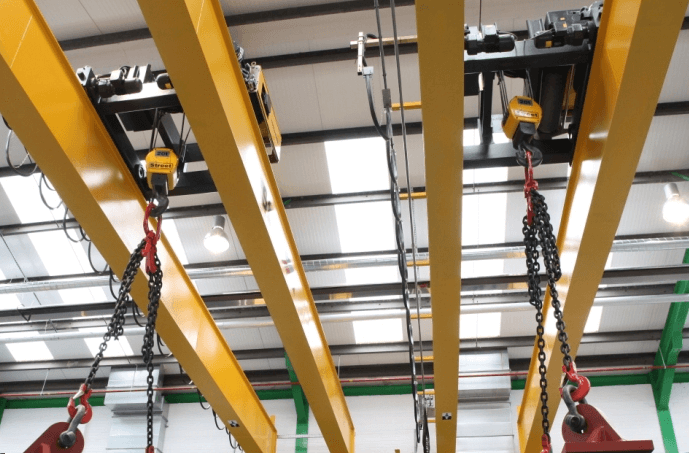 Perfect for single girder cranes the ZX hoist is available in 3 key models with lifting capacities up to 5t; 12.5t & 25 tonne. They will fit various flange widths up to 700mm. They are easily adjustable to suit a range of beam flange sizes. At each model capacity level there are many combinations of lifting heights and speeds available for maximum flexibility. 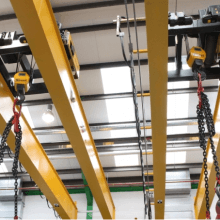 These monorail hoists are normally underslung and so are ideal where headroom is tight, such as in modern buildings with a low profile; the low headroom compact design enables optimum hook positions. The approach for both the side and end hook, are well designed to enable maximum floor coverage for optimum production space. This wire rope hoist unit consists of a double girder trolley, or crab unit to which the ZX base / foot mounted hoist is attached. 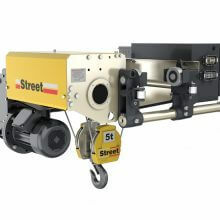 The ZX foot mounted wire rope hoist is also available separately. This low profile system is designed to travel in tandem across both beams on a double girder crane and the load sits on the hook in-between. 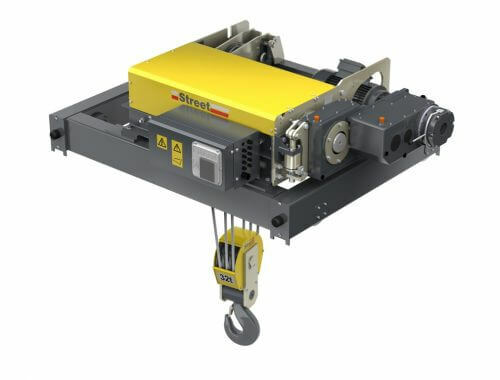 The double girder ZX wire rope hoist system enables the lifting of much heavier loads – up to 32 tonne (other lifting capacities are available); it also enables the load to be lifted higher, almost right up to the girder as the hook can be retracted up to its maximum between the double girders due to the rope diverter being off-set, therefore enabling a higher top hook position. The majority of the hoist models are available with upright/vertical or parallel hoist drum positions to optimise the side hook approach. We have a range of gearbox ratios, drum lengths and motor powers to choose from to ensure you get the perfectly matched hoisting system to suit your needs. Smart-drive on traverse movements to minimise swinging loads. 1 or 2 step traverse limit switches for slowdown and/or stop functions. Standby heaters in control panel, in hoist & trolley motor. 2nd hoist brake on hoist motor. Visual or audible overload warning signals. 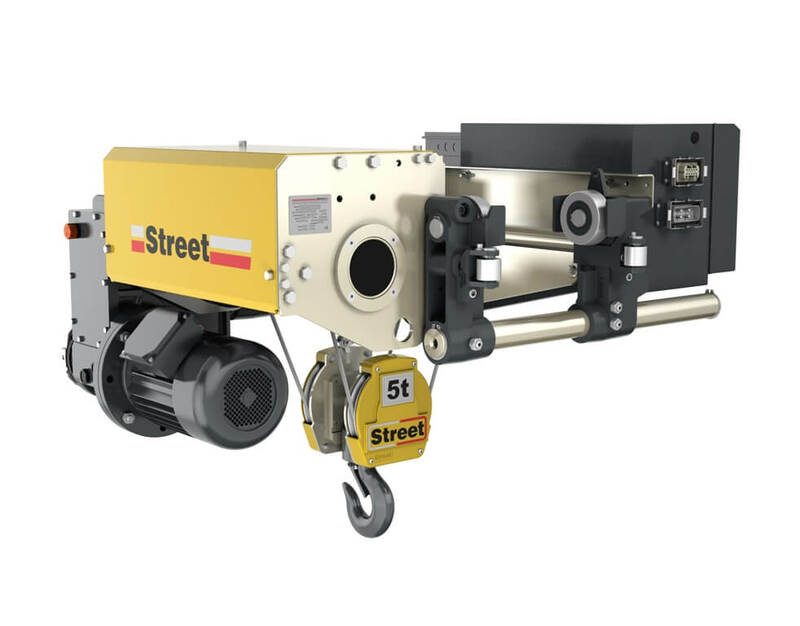 For more information about this range of wire rope hoists please give our sales team a call, let them know your requirements and a wire rope hoist can be put together to suit your needs.